When it comes to finding the best sat nav for you, there are a number of factors that can affect your decision. Your budget, driving habits and desire for tech from your system will all help you determine what type of model is right for you. There are a number of different designs available, all differing in price and capabilities. See the pros and cons of the different types of satellite navigation systems that you can find on the market, below. Built-in sat navs, also known as integrated sat navs, are satellite navigation systems that come supplied in a vehicle already. 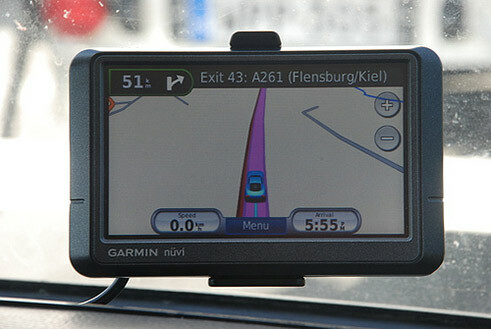 Built-in sat navs are usually of the highest quality, as they are installed by the manufacturer at factory quality. They often come with large displays, and can sometimes be linked to the dash for easier viewing. Built-in satellite navigation systems are normally integrated into the vehicle’s fitted sound system, providing superior audio quality. However, various downfalls include their static nature, expensive updates and often out of date maps. Dedicated satellite navigation systems often counter the problem faced by built-in models by offering a mobile alternative that is much cheaper. Usable in any car, designs are often mounted to the windscreen or dashboard via suction pads or clips, enabling them to be repositioned to a comfortable and suitable position within your vehicle. Mapping updates are cheaper and easier to obtain, as you can take them straight into the shop where they were purchased. Though more practical, dedicated satellite navigation systems are often designed with a smaller screen and can have lower quality function when compared to built-in models. Sat nav apps are the most obtainable and easiest form of satellite navigation system to use. Coming in the form of a mobile app, they are designed to be easy to use on a common interface that you use every day. Most up to date smartphones will come with a maps function already installed on the phone, which can be used as a functioning satellite navigation system. If not already installed, free or low costing apps can be downloaded from the marketplace. Although cheap and easy to use, mobile sat nav apps rarely outperform traditional models as satellite navigation isn’t their primary function. They will also usually require a compatible mobile phone holder to keep them in place, and can drain the battery life of your smartphone. If you’re still wondering how to choose a sat nav, then reading reviews before you decide on a model and using it in store, if possible, will help you get a feel for how it works. It is also advised that you purchase your satellite navigation system in store, as any updates or repairs are then much easier to obtain compared to when bought online. If you’ve already decided on your sat nav and are looking to take it for a test drive, see The 5 best routes to drive in the UK for some inspirational routes to explore.